Was born in 1855, and educated in London. He is owner of the fine s.y. Ladye Gipsey, and devotes a great deal of time to cruising in British and foreign waters. 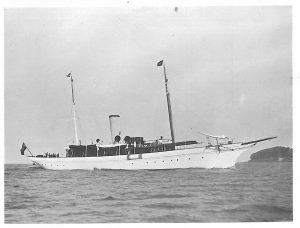 The Ladye Gipsey is one of the largest and handsomest steam yachts designed by the late Mr. Dixon Kemp. She was built by Messrs. Ramage and Ferguson, of Leith, in 1899, to Lloyd’s highest class. Sir Thomas is also keenly interested in the racing side of yachting. Clubs: Royal Corinthian, Royal London, Royal Southampton. Residence: Thornton House, Clapham Park, S.W.